A well designed door which is fully morticed and tenoned, that features six lovely shaped glazing panels with decorative Eyebrow feature mouldings to both faces. Fitted below is a large solid panel which is flush-fit to the front and has decorative mouldings to the rear. The door is suitable for external use, and fitted with a weather bar to the base. This pretty pine door is currently painted and would need to be stripped. We are happy to do this at an additional cost. 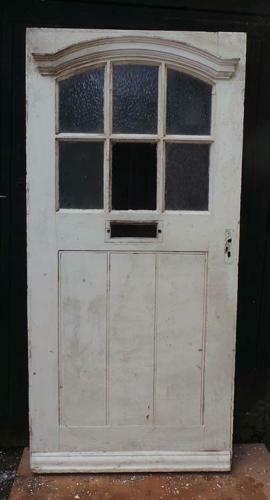 The door retains its original glass (1 panel missing) which would need to replaced to comply with modern safety regulations. Please contact us with your requirements.